An optional link from the gallery to any address you want can be added to all thumbnails and/or image pages in your gallery. Usually it is used to add a link to the gallery index page or to the main page of the site. To view or modify the properties of the link click the Link back properties button on the Thumbnails pages or Image pages tab of the Options step. All data that you enter in this window is used to fill different attributes of the .. tag when the gallery pages are created. The address of the link back from the gallery. It can be either full URL, starting with http://... or any relative address. The text that you enter in the Address field will be placed into the href attribute of the <a... ></a> tag. This is the text of the link. If you are not using image for the link, then this text is visible on the page. If you want to use an image for the link, the check the Use image box and click the ... button to select the image file name. You can choose any image. After you click OK the image you selected is copied into the files folder of the current gallery template. 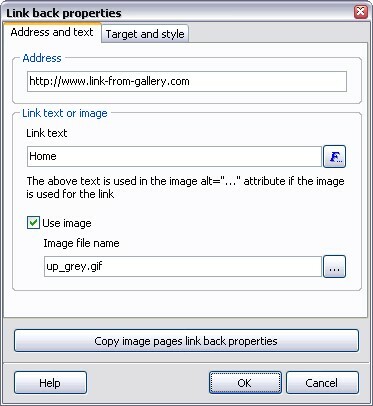 If the image is used for the link, then the text you enter in the Link text field is used in the alt attribute of the <img...> tag. You can choose one of the link target types here. If you choose the Open link in the same window then the target attribute is not added to the <a... ></a> tag. Otherwise the text from the Custom link target edit field is used for the target attribute. To add a CSS class or style attribute to the <a... ></a> tag check the Add CSS attribute to the link. If you want to add a CSS class name, check the Class name box and enter the name of the CSS class into the edit field. If you want to add inline CSS style definition, then check the Inline style definition box and enter the CSS text into the edit field.